Everyone's favorite warm oil massage workshop is back! 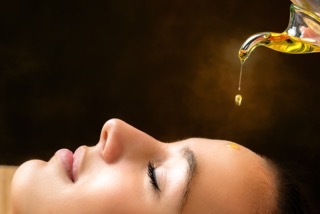 Rasayana or “rejuvenation” is one of the 8 branches of Ayurveda and means “that which destroys old age and disease”. The process includes a variety of practices to repair and revitalize the body, mind and spirit at very deep levels. Benefits of Rasayana include improved vitality, better immune functioning and a slowing down of the aging process. In the workshop you will learn all about this ancient practice as you engage in a gentle yoga practice designed for fluidity and restoration followed by a guided meditation to elicit deep relaxation. The highlight of the workshop is the giving and receiving of abhyanga (hot oil massage) to the feet and head. It's like spa day at the yoga studio! Yummmm! Enrollment is limited for this one, so sign up early!